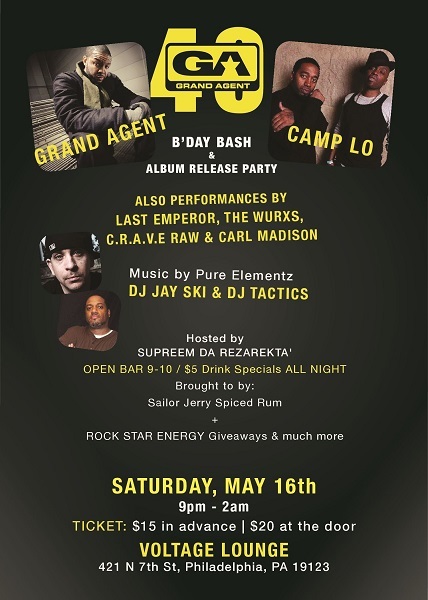 Heard the buzz about Grand Agent’s 40th Birthday Bash and album release party going down next weekend? The event will take place at Voltage Lounge in his hometown of Philly on May 16, and Camp Lo, Last Emperor, The Wurxs, Journalist, Carl Madison, and C.R.A.V.E. Raw will all be on site to celebrate the artist and his latest album, AC Hip-Hop. GA will be performing brand new music off the album, and ladies get in free with an open bar before 10pm. Also, make sure you download the album for free here and for all things Grand Agent, including videos and to purchase official GA merch, visit his official site here.